Shared Space features work by Monique Ford and Susan Ross. For a number of years the two artists have shared a painting studio and a natural dialogue arose. Within their abstract paintings, flowing forms and idiosyncratic colors sweep, collide and settle into rich and provocative relationships. 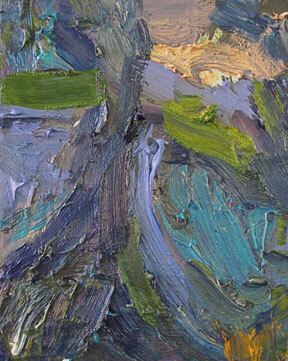 Ford's textured and muscular paintings engage mark-making and the materiality of paint. Movement, energy and flux are at the heart of her work. The smooth layers in Ross' paintings simultaneously evoke movement and stillness. The relationship of color and shape in her work creates a push and pull dynamic, eliciting a rhythmic contemplative space. Ford's and Ross' paintings provoke similar reflections on the ways forms occupy and push beyond the canvas. The artists both create images that feel like a "slice of life" -- snapshots of something more expansive. The viewer is drawn into the intimacy of these close up "internal landscape" worlds, while the forms contained within the canvas seem to flow and extend out into the surrounding space. Accompanying the exhibition are essays by Mario Naves, an artist, writer and teacher who lives and works in New York City, and Sarah Wadelton, a writer living in Brooklyn.